During the Industrial Revolution, companies attempted to maximize the output of their factories by keeping them running as many hours as possible, typically implementing a “sun up to sun down” work day. Wages were also extremely low, so workers themselves often needed to work these long shifts just to get by, including often sending their children to work in the factories as well, rather than getting them educated. With little representation, education, or options, factory workers also tended to work in horrible working conditions to go along with the bad hours. The typical work day at this time lasted anywhere from 10-18 hours per day, six days a week. This all began to change in the 19th century. The first to suggest an eight hour work day for everyone was a British man by the name of Robert Owen, who was also one of the founders of socialism. Owen felt that the work day should be divided into thirds, with workers getting equal time to themselves and to sleep as they do for work. Thus, in 1817, he began campaigning for an eight hour working day for all workers, coining the phrase, “Eight hours labour, eight hours recreation, eight hours rest.” Unfortunately, this did not catch on for some time, though throughout the 19th century a series of Factories Acts were passed that steadily improved working conditions and reduced work hours for factory workers. For instance, The Factories Act of 1847 stipulated that women and children were to be granted a ten hour work day, thus only having to work 60 hours per week. 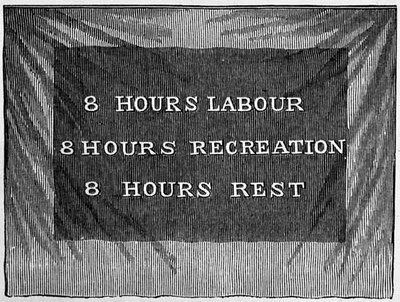 The eight hour work day cause was taken up once again in Britain in 1884 by Tom Mann who was part of the Social Democratic Federation. Mann subsequently formed an “Eight Hour League” whose sole goal was to get the eight hour work day established. Their biggest victory came when they managed to convince the Trades Union Congress, which represents the majority of unions in Britain- and does so even to this day- to establish the eight hour work day as one of their primary goals, which they subsequently began to work towards. The push for a shorter work day began earlier in the United States, in 1791, with workers in Philadelphia striking for a ten hour total work day that would include two hours for meals. By the 1830s, support for eight hour work days was shared among the majority of the working class people in the United States, but still failed to find support among business owners. Over the next few decades, workers continued to hold strikes demanding shorter working hours and gradually things began improving. 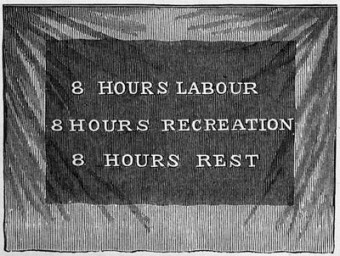 Momentum for the cause particularly picked up with several “Eight Hour Leagues” forming in the United States, as Mann had formed in Britain around this same time. In 1884, the Federation of Organized Trades and Labor Unions declared that May 1, 1886 would be the first day that an eight hour work day would be made mandatory. This, of course, was neither backed by any federal mandate nor the businesses themselves and relied on workers striking and raising a general ruckus to drive the point home. When May 1, 1886 arrived, the first ever May Day parade was held with 350,000 workers walking off their jobs protesting for the eight hour work day. Progress was still slow though and it wasn’t until 1905 that industries began implementing the eight hour work day on their own accord. One of the first businesses to implement this was the Ford Motor Company, in 1914, which not only cut the standard work day to eight hours, but also doubled their worker’s pay in the process. To the shock of many industries, this resulted in Ford’s productivity off of these same workers, but with fewer hours, actually increasing significantly and Ford’s profit margins doubled within two years after implementing this change. This encouraged other companies to adopt the shorter, eight hour work day as a standard for their employees. Finally, in 1937 the eight hour work day was standardized in the United States and regulated by the federal government according to the Fair Labor Standards Act. It stipulated that workers were not to work more than 44 hours per week and any hours over 40 required of the worker were to be paid with overtime bonuses added to their normal pay rate. Why Is it Illegal to Remove Mattress and Pillow Tags? Boston ship carpenters managed to achieve a set eight-hour work day in 1842, well before most other industries. Amazingly, they managed to do this despite not being unionized. Despite some industries in the United States, such as the previously mentioned Boston Ship Carpenters, managing to achieve eight hour work days, the average work week in the United States in 1890 was around 90-100 hours per week for most building tradesmen according to a survey done by the federal government at that time. The Haymarket Square Rally on May 4, 1886 in Chicago protesting long labor hours got so out of hand after a dynamite bomb went off that a quick trial was taken and four men were hanged straight away, even though there was little evidence linking them to the bomb. They were likely simply at the wrong place at the wrong time. Through similar protests and lobbying as were used in Britain and the United States, Australian workers were granted an eight hour work day on January 1st, 1948. India was, by far, one of the more progressive countries regarding labor practices. India introduced the eight hour work day in 1912 – a full 26 years before the United States. In the early 19th century in Britain, a series of “Factories Acts” were passed meant to help improve working conditions for workers, particularly for children. One of the first of these was in 1802 and stipulated children under the age of 9 were not to be allowed to work and, rather, must attend school. Further, children from the ages of 9-13 were only allowed to work eight hours per day and children from 14-18 could only work a maximum of 12 hours per day. Unfortunately, this law was largely ignored and almost never enforced in any way. Even when it rarely was enforced, the fines were small enough that it was more profitable for factory owners to break this law and pay the fine, than to follow it. The act also did nothing for adults except require that factories be well ventilated, though it did not stipulate what defines “well ventilated”, so factory owners could easily ignore this part of the act as well. You’re an economic illiterate. Work hours weren’t reduced because some socialist declared they should be less. They were reduced because the industrial revolution made production more efficient, meaning goods were cheaper. Thus, people could work less hours and still get by. People have been working long hours for our entire existence – Why don’t you go back and have a look at the poor farmers of the dark ages, who worked their farms from sunrise to sunset. They couldn’t just declare “oh, I think I’ll only work 8 hours a day because that’s fair”, that would result in their family starving to death. Nothing’s stopping you from reducing your work day to 4 or even 2 hours. Except the fact that you won’t be able to afford as many luxuries, of course. @asdf: I think you should read the article again. Nowhere does it say they were reduced “because some socialist declared they should be less”. Also, you should study history and business more. Things aren’t so simple as “made production more efficient”. It should also be noted that this article was about why we have the specific eight hour work day. It’s not about the general case of why we have reduced hours compared to a century or two ago. Noah did a pretty darn good job at encapsulating the heart of that in a form that isn’t akin to reading a whole textbook (which frankly, this subject could be expanded into to quite easily, but isn’t exactly a form that would be popular on the internet) :-). Ugh, such an old comment but can’t resist replying because of that blend of ignorance and arrogance. The working day was reduced because of class struggle – by organising into unions, demanding higher wages and better conditions, it becomes proportionally cheaper to replace and reduce human labour with machinery. In a low wage economy there is less incentive to invest in constant capital – makes no sense to replace 10 workers on £5 a day with one machine costing £60 a day, but if they organise for £7 a day then it makes sense to try and apply such technology. Otherwise even if technology is available to replace them, why would you bother if you can get the job done more cheaply using human beings? So, less human labour is required across an economy while the same is being produced. Cuts to the working day become possible, and advantageous if unrmployment is growing too high. So yes, we can thank socialists for the 8 hour day and full day’s wage. @asdf A lot is stopping you from working a 4 or 2 hour day, like not being able to hold a job because no employer wants you. 2. Failing to understand that results can have more than one cause. I hear people, especially Americans, screaming “Socialism” at every change in anything. I like to point out that everything they think is great about their lives was condemned as socialism when it was introduced. Now, this article has added the 8-hour workday to police and fire departments, public schools and roads, stop lights, libraries, social security, retirement benefits, medicare. The Rural Electrification project brought the benefits of electric lights, refrigerators, and washing machines to the millions of farm families that would otherwise have been without them for many more years. All were “socialist” at the time, but how many of even the most rabid Tea Party people would go without them? I can assure you I am one of the more economically literate people (being a major myself) and I can also assure you that the industrial revolution had nothing to do with the 8 hour workday. In the wee early parts of the 20th century, children were working 16 hour days in steel mills. Towns were still effectively run by the largest employers in the area. They made sure people could not leave and get new jobs because they would come up with ways of cutting daily wages in half for outrageous things like getting just a single stone into a cart of coal. In short they had the power to make people indebted to them, they could own their laborers almost in a slavery sort of way. Why do I mention all of this? It happened well after the industrial revolution was pretty much over. The first industrialist to think to give his workers a decent living wage was Henry Ford. However, Ford was alone amongst industrialists here. Unlike for example Carnegie, who green-lighted some pretty horrifying acts against laborers so he could maximize his monopoly profits, Ford wanted to mass-market a product at the lowest possible price giving his workers the highest possible wage. Keep in mind this is not a work-hours statistic, these are merely wages I am referring to. So even that point does nothing to further your argument. So no, the 8-hour workday was not a relic of the “gilded age.” It was a victory of unions. Consider that your daily Labor Economics course. Why is there no mention of Industrialist Henry Ford when I read articles about our present workday and wages? Without him, it is likely many decades would have passed before the corrupt and often criminally based unions could have obliged. All you hear about is the Haymarket “massacre”. That was the day some anarchists and socialists attacked some scabs and got beat down. Bring back the 8 hour day. Its slowly being taken away and were letting it happen through fear of being fired and lack of work. If we fear these things they will come true. No more desk lunching. No more staying behind. Productivity is also down. Look at the germans. Haveth we learnt nothing? Working 40 hours a week is overrated. Our society is constructed around the idea that everyone should work full time when there has been many technological advances since the 8 hour work day first became standard. If you’re not going to school, you should work full time. If you’re not staying at home to look after your family, you should work full time. If you’re not doing anything, you should work full time. If you can’t find a job, it’s most likely because you can’t work full time. Not due to your skills or chosen line of work. If you can’t work full time, you’re going to be stuck flipping burgers at McDonalds or working in retail the rest of your life. Everyone should work full time, because some guy almost 100 years ago said this was the “standard work week”, and no one seemed to question him since then. Well, except a few brave people like me. Due to technology advances, people shouldn’t have to work as much. Some are even advocating for a 6 hour work day. Even people like Larry Page or Carlos Slim suggest we should only need to work 3-4 days a week, instead of the usual 9 to 5 that society seems to think is the “normal” work schedule that will forever always be. Those guys are my heroes.